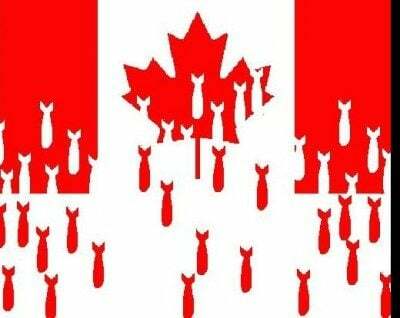 Dear Canada: Your government supports al Qaeda and al Qaeda-affiliated terrorists. It supports all of the terrorists in Syria. Some of these terrorists are coming home to Canada. As a Canadian you can do little about this since you have supported these terrorists yourselves with your silence and your support for your government’s terrorist-supporting foreign policy. According to Times reporter Rukmini Callimachi, and confirmed by “multiple intelligence agencies”, Abu Huzaifa “al-Kanadi” has been a member of ISIS in Syria. Reportedly, he fought for ISIS in Manbj Syria. 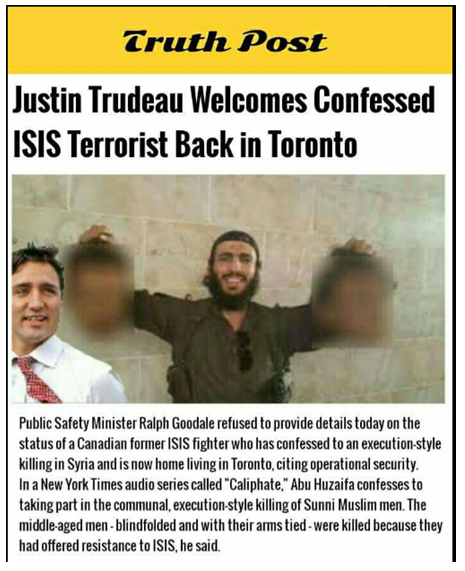 Now, he has returned home to Canada, and Public Safety Minister Ralph Goodale refuses to provide details on his status. When any government, including Canada’s, supports terrorists, it is unreasonable to expect that such terrorists, on returning home,will be subject to public criminal trials, since such trials would necessarily reveal the government’s criminality. John Lancaster, Kathleen Harris. “Conservatives grill Goodale about Canadian ISIS fighter shortly before he recants murder claim|Former jihadi retracts his detailed account of killings in New York Times podcast.” CBC News. 11 May, 2018. (http://www.cbc.ca/news/politics/isis-canadian-fighter-execution-1.4658607) Accessed 13 May, 2018. Stuart J. Hooper, “Terror Trial Collapses: Suspect Accused of Supporting Syria Fighting Groups Backed by British Intelligence MI6.” Global Research, 6 June, 2015. 21st Century Wire 4 June, 2015. 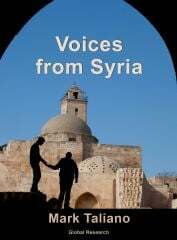 (https://www.globalresearch.ca/terror-trial-collapses-suspect-accused-of-supporting-syria-fighting-groups-backed-by-british-intelligence-mi6/5453694) Accessed 13 May, 2018.